High frequency electric resistance welded pipe, also known as ERW steel pipe. ERW has many advantages, such as high production efficiency, low-cost, saving in material, and easy-to-automation. It is a kind of important welding technology which is widely used in various industrial sectors such as aviation, energy, electricity, automobile, light industry and so on. ERW steel pipe uses hot rolled coil as raw material, its wall thickness is uniform and is controlled at ± 0.2mm or so, the two ends of the pipe should repair the end, bevel, and cut to length according to the United States APl standard or GB/T.1 standard. Compared with the submerged arc welding process, ERW welding process does not add any welding materials, weld molding has not been hot-melting state, the weld metal goes through the recrystallization process, so the formed weld is completely the same chemistry as the base metal. The steel pipe after welding will be annealing, manufacturing cold forming internal stress, welding internal stress are improved, so ERW steel pipe comprehensive mechanical properties better. ERW steel pipe is mainly used for conveying oil, gas and other vapor-liquid objects, to meet the high and low pressure requirements. At present, the field of transportation and transportation in the world plays a heavy role. In recent years, the engineering gas has been widely used ERW steel pipe as the main gas pipe network. About more details about definition, manufacturing process and application of ERW steel pipe, you can click the hyper-link to know. 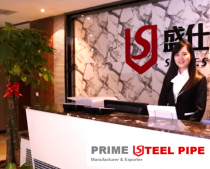 If you have any requirements of carbon steel pipe or steel pipe fittings, Prime Steel Pipe will give you the most complete solution.